Haworth ~ A Rainy December Walk and a Wander up the Cobbles. Sunday mornings unpromising weather predictions didn’t put us off our intended trip to Haworth. Our plan was to take a walk from the town, over the surrounding moorland to Top Withens . The wild location of the ruined farmhouse is thought to be where Emily Bronte pictured ‘ Wuthering Heights ‘ in her novel. We put Hugo in the back of the car, picked up my sister and niece and made our way to Yorkshire, wind screen wipers on the go. Amazingly the rain seemed to clear up once we arrived in Haworth. A walk over Haworth Moor was still on the cards. Raincoats on, we set off from the Brontë Village Car Park, and would you know it within five minutes, the weather could definitely be described as wuthering! We were blown past the ‘Literary Landscape Sculptures’ two sets of five stone books peering up from the heath. The sweeping rain prevented me from getting any photos. At this point we decided to only walk as far as the Brontë waterfalls, and save Top Withens for another day. The Brontë Waterfalls lie some 2•5 miles over the moor. A well trodden path leads all the way there and is clearly signposted too, surprisingly in Japanese as well as English. Described by Charlotte Brontë as ‘ a perfect torrent racing over the rocks, white and beautiful’ the falls on Sunday were definitely more of a trickle than a torrent. However the setting is lovely, even on a dreich December day. As yet,shades of copper bracken add colour to the rugged scenery and a babbling beck gives drama to the landscape. You can see why the Brontë siblings enjoyed walking here. Below the falls a stone footbridge known as the Brontë Bridge crosses the stream and the path continues onwards towards Top Withens. We posed in the rain for a quick selfie and were soon joined by a group of hardy ramblers who chose this glorious spot for a lunch break. It was amazing how many other walkers we had seen along the way, despite the dreary weather. Our tummy’s rumbling and feeling rather like drowned rats, we decided to retrace our steps back to Haworth, where the promise of a hot meal somewhere warm and dry beckoned. Haworth is definitely somewhere that feels incredibly festive at this time of year. After warming up in a welcoming ( and dog friendly) cafe on Main Street called The Cook House, we went for a wander along the cobbles, listened to Christmas carols, visited some lovely independent shops and found a bustling Christmas market in Central Park. I’m sure we will return in the Spring, for another stride over the Moors, in the footsteps of the Bronte’s. Snowdrops and the Sea ~ Hornby Castle and Morecambe. Hornby Castle from the weir. It was lovely to see all the many varieties of snowdrops in bloom. They carpeted the woodland, grew in thickets by the river and adorned the lovely walled garden. Hugo’s favourite part was exploring the riverside walk. The village of Hornby itself is quite pleasant and Hornby Post Office & Tea Rooms are a very good stop off point for a spot of lunch. The picture above is quite deceptive as the place was absolutely rammed, due I think to the Snowdrop Weekend and a second hand book sale in the village. The old fountain in the village depicts a cat with a rat in its mouth, said to represent the former owner of the castle, Pudsey Dawson, who brought in cats to clear the castle of a huge rat population in the 19th century. Yikes! In the afternoon we headed to the coast and went for a blustery walk on the beach in Morecambe. Luckily at this time of year you can depend on pup friendly beaches, even if it is somewhat freezing! Morecambe has appeared in my blog quite a few times so apologies for any repetitive photos. Its a very photogenic place though, if a bit worn and weather beaten. The bracing winds encouraged us to head for the Midland Hotel that looks over the bay and the long stone jetty, decorated ( as much of the town is) with seabird sculptures and poems. The Midland is a Grade II listed Art Deco design hotel , which was built in 1933 by the London, Midland and Scottish Railway. Like many grand seaside hotels it fell into disrepair and decline. In 2008 it was re-opened to the public, all restored and its elegant curving façade happily housing a lovely hostelry once again. After enjoying our hot drinks we headed home through the Trough of Bowland, calling in at my sisters for another brew. Can’t get enough of brews in this weather! Sixteen Pet Friendly Places Visited With Our Dog. As my other half and I are ‘owned’ by a bouncy black labrador, our days out and holidays are often planned round walks and pet friendly places. With this in mind, here are a few of Hugo’s ( and our) favourite haunts, over the last 3 years. Allan Bank , Grasmere, Cumbria. There are not many National Trust properties that allow dogs inside. A charming exception, a short walk from Grasmere, is a former home of poet William Wordsworth. Not every room is decorated however, so this Georgian Manor has a relaxed carefree vibe. The grounds are worth an explore too and include a woodland walk and gardens. Sadly there is no cafe on site at present, though you are welcome to make yourself a brew. Open this year from the 10th February. You can read about our visit here. Another Place, Crosby Beach, Merseyside. An atmospheric and thought-provoking art installation. 100 iron figures grace Crosby Beach, all identical , all modelled on their creator Antony Gormley, all stand staring out to sea. A stunning spectacle and a great place for a bracing beach walk. Pay and display parking but there is also free parking at nearby Crosby leisure centre. Conishead Priory, Ulverston, Cumbria. Although this Gothic Priory is now a Buddhist Retreat , the grounds, gift shop and cafe are all open to the public. We have visited maybe three times now with Hugo, for lovely woodland walks that lead down to the beach. A January trip saw the woods abundant with snowdrops. Look out for the Buddhist temple and a giant golden buddha! Parking is free and you can eat with your dog in a comfy lounge, next to the cafe. A UFO ? 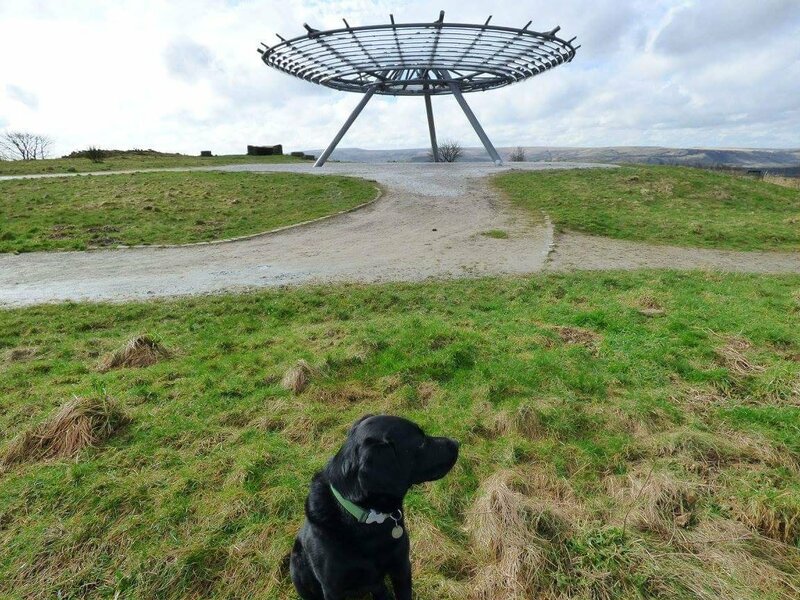 ………..or Haslingden Halo. Formby Point Red Squirrel Reserve, Formby, Merseyside. Formby has a great dog-friendly beach with sand dunes and coastal pine forests which are home to Lancashire’s only native red squirrel population. 🙂 The Squirrel Walk is a must if you wish to see these cute tufty creatures. Parking at The National Trust Car park. Dogs on leads in the reserve. 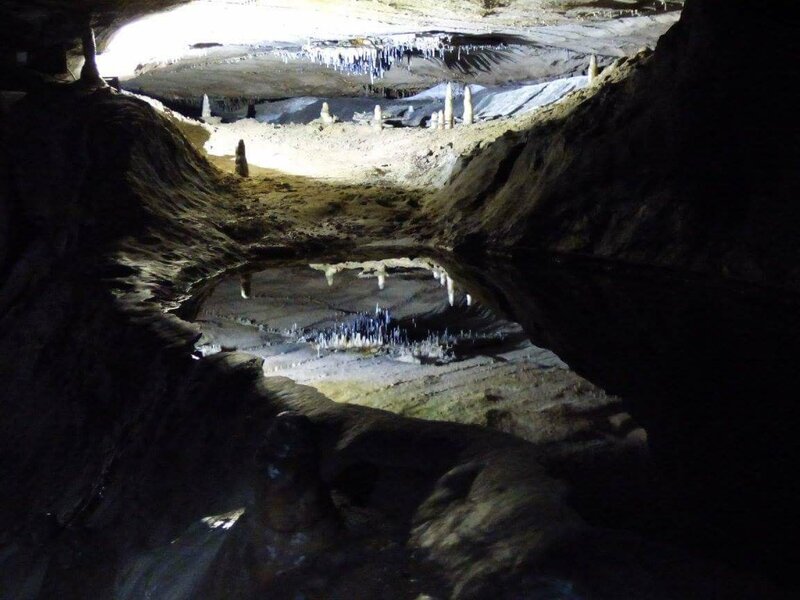 You can read about my visit Sea Air ~ Squirrels and Naked Men on the Sefton Coast. .
Ingleborough Show Cave, Clapham, Yorkshire. We had no intention of touring this grand Victorian Show Cave but having stumbled upon it whilst walking along Clapham Nature Trail, we found that dogs are admitted. 🙂 The tunnels are well lit, though low in places. The tours are interesting and the shop at the entrance sells snacks and souvenirs. Find out more here . Janet’s Foss & Malham Cove, Yorkshire Dales. The Yorkshire Dales is renowned for its beautiful waterfalls and Janet’s Foss is no exception. There is a stunning woodland walk from Malham village ( start at the Smithy) leading to the falls ( home to a fairy) and Gordale Scar. Another walk from the village takes you to the impressive Malham Cove , with its unusual limestone rock formations. I blogged about Malham here . Hugo and friend at Janet’s Foss. Morecambe Bay Cross Bay Walk, Arnside, Cumbria. In 2016 we walked across the shifting sands of Morecambe Bay between Arnside and Grange-Over-Sands. As you can see walking actually means wading…partly. And some swimming for Hugo! Bay walks are organized group walks and should not be attempted otherwise. You can read about our attempt here. Pendle Sculpture Trail, Barley, Lancashire. The natural world and the Pendle Witches have inspired this informative ( and stunning ) trail through woodland near Barley. Park at the village car park ( pay via an Honesty Box) and walk for one mile, passing a reservoir, to Aitken Wood. I blogged about a pre Hugo visit here. I can only apologise that most of our days out have been in the North of England. But maybe that will be an incentive to holiday here with your hound. 🙂 If you have any recommendations for dog-friendly places to visit ( anywhere) please comment below. Ingleton ~ Camping and Waterfalls. Oh British Summertime where are you? Oh wait, this is British Summer Time!! We have just returned from a camping weekend with friends ,in the Yorkshire Dales. We donned our wellies and waterproofs and didn’t let the continuous downpours spoil our fun. 🙂 Happily we found a really good campsite just outside of Ingleton village, which definitely catered to all our needs. Meadow Falls is kid and dog friendly. The site also welcomes dogs and has an enclosed dog exercise area ,plus there is even a warm water dog shower! A recently refurbished family and dog-friendly pub, The Marton Arms, is only a 5 minute walk away. And Ingleton with it’s host of shops, cafes and pubs is about 15 minutes walk. Pretty much the perfect campsite then for our band of five adults, two kids and two dogs. Ingeborough is one of Yorkshire’s Three Peaks. The girls wanting to test out the ‘dog shower’. 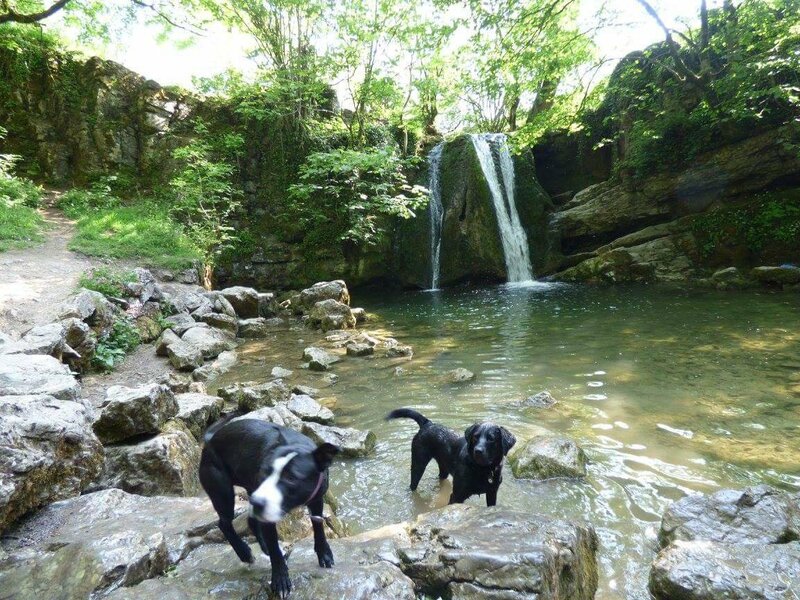 The weather did not play ball on this trip, for a splash around in Ingleton’s Open-air swimming pool , so we decided to have a splash around the Waterfall Trail instead! The Ingleton Waterfalls Trail is a four and a half mile waterfall wonderland and is well signposted in the village. There is a charge for the upkeep of the trail. Adults £6, Children £3 and a family ticket costs £15. The trail winds its way through woodland , following the River Twiss and the River Doe. It also covers rugged moorland and as a geological site, much of the trail has been designated a Site of Special Scientific Interest. Here are a few pictures from our walk. Muddy hands and a Money Tree. Bridge over the River Twiss. The refreshment hut at Pecca Falls makes great hot dogs. The sun came out at Thornton Force. It is possible to stand behind the waterfall. Emerging Ghyll Scramblers or Canyoners. Brrr , must have been cold! Drying off in The Wheatsheaf. Luckily later on it stayed dry enough for a barbecue and the kids showed us how to make marshmallow toasting sticks, with the aid of potato peelers and gardening gloves! Hugo eyes up the BBQ. Toasting on the cobb. We will definitely hire a fire pit next time!